'then' Is Now an Alias for 'yield_self' (in Ruby 2.6) — Kernel#yield_self was added to Ruby 2.5 as a way to yield the receiver to the given block and return any onward result. It’s awesome but there have been doubts over its name. Matz has now considered things and has declared then as a suitable alternative. Setting Up a BDD Stack on a Rails 5 App — Learn how to generate a new Rails 5 application with all the necessary tools to set up a behavior-driven development (BDD) flow - RSpec, Cucumber, FactoryBot, etc. 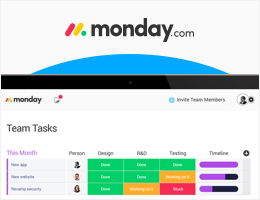 The New Generation of Project Management Tools Is Here and It’s Visual — monday.com is a project management tool your team will actually enjoy using. It makes it fun and easy for everyone to collaborate, focus on what's important, and get more done at work. A visual project management tool that’ll help you achieve more together. JRuby 9.2.0.0 Released — The highlight feature in this release of the popular JVM-based Ruby implementation is Ruby 2.5 compatibility. Spina CMS 1.0: A CMS for Rails Devs — An attractive CMS for Rails 5.2 has reached its 1.0 milestone and has added support for ActiveStorage. GitHub repo. TestProf: Factory Therapy for Your Ruby Tests — TestProf is a set of tools aimed at making your tests ‘healthier.’ We linked to an introductory post last year. In this post, the tools targeting factories and their overuse are demonstrated. A Simple, Async, Map/Reduce Queue for Ruby — Not many people would choose Ruby to perform a task that requires concurrency, but Luca Guidi at DNSimple did and he was pleasantly surprised. 9 Ruby Conferences Worth Seeing This Summer — If you go to all 9, you will have both our admiration and envy. Copart Is Looking for a Senior Ruby Developer — Dallas, TX — We're seeking a passionate, opinionated Ruby developer to build core product from the ground up for a $12B stable and growing company in the US and India. Senior Software Engineer - San Francisco, CA — Love to travel? Help us build and scale the platform behind the best mobile hotel booking experience out there. Ruby Expert? Sign Up for Vettery — Top companies use Vettery to find the best tech talent. Take a few minutes to join our platform. Railway Oriented Programming in Ruby — Railway Oriented Programming is a pattern to handle results (meaning, success or failure) of operations using monads. Rails Gaining a Eumerable#index_with Method — A handy method for more quickly building hashes from an enumerable of keys. Running Chrome Headless, Selenium and Capybara Inside GitLab CI and Docker — Selenium and Chrome Headless were failing with mysterious errors when run in GitLab CI and Docker. Here’s why, and also how Phusion fixed it. Slow CI Build? Make It Run in 2 Minutes or Less with Boosters — Get your team a faster feedback loop. Automatically parallelize your Rails CI build in one click. Faster JSON Generation using Postgres's JSON Function — If you want to boost JSON serialization and are willing to sacrifice some complexity, check this. Quick Tip: Content-Type application/json by Default in Rails 5 — Ideal for Rails API-only apps, perhaps. The Case for 'before_validation' Callback: Complex State Normalization — Usually, posts about ActiveModel callbacks are warning you off but here’s a case for using one. Stealth: A Framework for Building Conversational Bots — A Rails-inspired MVC framework for building conversational voice and chat bots. Currently the strongest integrations are with Facebook Messenger, Twilio, and Amazon Comprehend for NLP.